The 4th annual German Stevie Awards is now accepting entries. Companies and organizations from all industries can now enter nominations free of charge for their best projects and achievements, to compete for the coveted Stevie Awards trophies. Early-bird entrants will benefit from a reduced winners fee until December 6, 2017. Since the founding of the International Business Awards in 2003, the Stevie Awards have become firmly established in the global economic world. Since 2014, the German Stevie Awards have been offering companies operating in the German market a competition platform for national benchmarking. The entrants may choose from a great variety of categories, such as awards for entire companies and organizations, that honor the achievements of for profit and non-profit organizations, large and small, private and public. New at the German Stevie Awards in this year are the categories “Entrepreneur of the Year” in 34 industries as well as the title “Solo Entrepreneur of the Year”. The entry kit and a complete overview of the categories and subcategories are available at www.StevieAwards.com/Deutschland. There are many other categories to recognize achievement in every major business function, including product development, marketing, customer service, human resources, public relations, technology, and more. Michael Gallagher adds: “Many categories of the German Stevie Awards also honor great achievements in the field of business-related media and publications.” This includes awards for live events, annual reports and publications, app development, videos and websites. This year, participating organizations can expect a slightly different way to submit nominations. For the first time, the German Stevie Awards will waive the general entry fees and replace them with a special winners fee. This means that entrants can submit unlimited nominations in unlimited categories free of charge. Instead of paying an entry fee for each submitted entry, entrants will only pay a winners fee per successful nomination. Each nomination that wins a Gold, Silver or Bronze Stevie Award will be assessed a winners fee of 400 euros. Companies submitting their nominations through the first entry deadline, December 6, 2017 will benefit from a reduced winners fee of 375 euros per winning nomination. The payment of the winners fee will unlock the right to publicly claim Stevie-winner status and the winner will be listed in the official winners list. There are more benefits, including access to all judges’ comments about all of their entries and the right to receive their award on stage at the awards ceremony. If entrants miss the December 6 entry deadline, they will still be able to submit their nominations through January 24, 2018. Several juries of leading German business executives will determine the Gold, Silver and Bronze Stevie Award winners. A complete list of all 2017 Gold, Silver and Bronze Stevie Award winners by category is available here. For high-resolution photos of the Stevie Award trophy or the German Stevie Awards logo, visit http://stevieawards.com/gsa/photos-and-logos. We are happy to provide you with more press photos from previous winners and awards shows on request. Learn more about the German Stevie Awards 2018 at www.StevieAwards.com/Deutschland. Picture a group of young entrepreneurs with a creative vision and combine that with a huge, empty former tank factory. That’s right: a factory hall of 5.000 square meters, with a ceiling height of up to forty feet– a gigantic hangar that used to house the production lines for war machines until it closed down a good two decades ago. A big, empty hall, located conveniently close to the city center of Mainz, Germany, which, in turn, is just around the corner from Frankfurt. Local entrepreneurs Ralph Heinrich and Dr. Hanns Christian von Stockhausen were intrigued, while also saddened, by the city’s decision in early 2015 to end the place’s 17-year tenure as a makeshift theatre venue. The local government had used the hall for cultural events since the shutdown of the tank factory in the mid-1990’s. 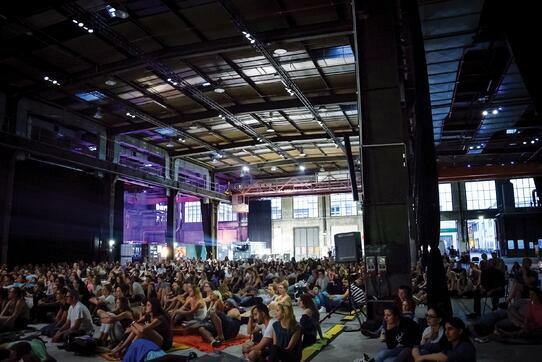 That was when the idea was born to revive the venue, formerly dubbed ‘Phoenix-Halle’, and transform it into ‘Halle 45’: a one-of-a-kind event hall and meeting place at the intersection of art, culture and entertainment. The goal was to create a venue unlike any other, innovative and modern, versatile in size and functionality. Ralph Heinrich and Dr. Hanns Christian von Stockhausen founded Halle 45 GmbH in May 2015 and turned their vision into reality. The story of Halle 45 GmbH, the ambitious, hard-working start-up from Mainz, Germany, is a unique one, and so is its motto: “The worst crime is faking it”, coined by grunge pioneer Kurt Cobain. Since its inception in 2015, the event management company, now a team of twelve full-time employees, has successfully hosted a huge variety of events at the venue, from concerts and art exhibitions, over indoor cinema, food and craft beer festivals, to industrial fairs and corporate events. From the very start, the company also committed itself to opening the venue’s doors to non-profits and artists free of charge. Thus, the former tank factory has also hosted events like a “welcome celebration” for refugees and charity concerts. Charitable projects aside, the founding of Halle 45 GmbH depended on investors and needed to see profits. In the business of acquiring corporate clients, the start-up had to come up with a solid sales strategy. The starting conditions were phenomenal: Halle 45 is the second biggest venue of its kind in the metropolitan Rhine-Main region, comprising the cities of Mainz, Frankfurt and Wiesbaden and a combined total of nearly 6 million inhabitants – an economically thriving area. The city of Frankfurt is known for its trade fairs and its growing financial district, while Frankfurt Airport is a major international air traffic hub – one of Europe’s biggest. Another big plus: Halle 45’s innovative, versatile concept features the option to partition the space into several, individually sized venues. Add state-of-the-art technical equipment, the site’s superior amenities and professional event management – an unbeatable recipe for success. However, in order to garner your target audience’s attention, you need traction and media attention. 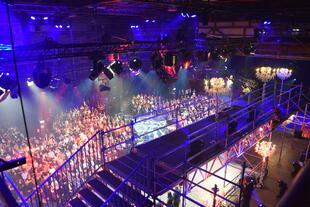 That’s where the Stevie® Award really helped Halle 45 GmbH to turn a page in its young history. Ever since winning the Bronze Stevie Award at the 2017 German Stevie Awards in Hamburg, the start-up’s social network contact rate has hit untold highs. 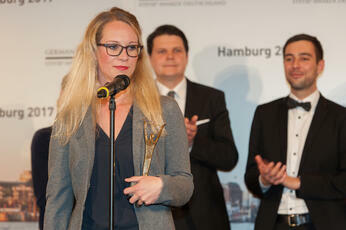 Since winning the Stevie Award, Halle 45 GmbH has also picked up other awards, among them the Mainz Business Prize. Within a period of merely two years, Halle 45 GmbH has established itself as a major venue in the Rhine-Main region – not only for cultural, but for corporate events as well. optivo in Berlin, Germany won two Stevie® Awards in The 2014 International Business Awards: its Customer Care Team won a Bronze Stevie in the Customer Service Awards categories; and its optivo® broadmail–Marketing Automation Solution won in the New Product Awards categories. We asked Harald if he had any advice for companies thinking of doing business in Germany. Harald also gave us some tips on a few of the apps and blogs that he finds most useful in the workplace. optivo’s main product is optivo® broadmail, which enables optivo clients to send out permission-based and professional newsletters as well as email marketing campaigns. optivo® broadmail is an internationally applicable solution for all business sectors and industries. The user interface is available in English, German, Polish, Dutch, and Turkish. The software includes more than 300 functions and can be used via all relevant web browsers. Its customers can send out up to 25,000,000 emails per hour. Furthermore, it is continuously being updated and developed. New functionalities are provided regularly and made available free of charge to optivo’s customers. The optivo customer care team helps with advice and assistance in all matters concerning the use of optivo® broadmail. Online marketing specialists create customer templates for a consistent corporate design and give international support regarding the use of the online broadcasting system as well as email and omnichannel marketing in general. The staff is multinational and supports customers in various European languages. optivo offers workshops on email marketing strategies, customer training, and academies. Its customers receive regularly updated documentation, technical white papers, video tutorials, and newsletters. Through its blog, optivo offers in-depth information on relevant topics concerning email and omnichannel marketing to all interested parties. Customers can also subscribe to a newsletter series that offersuseful tips on email marketing over the course of one year, and they can attend free webinars on special topics which are held on a regular basis. Harald Oberhofer is Director of Corporate Communication at optivo. He has 14 years of experience in PR and Marketing in the online sector. Harald joined optivo in 2007 in order to set up the Marketing Department. His current responsibilities are the management and coordination of international and corporate PR and marketing communications activities. Prior to optivo, Harald worked for Zanox and IBM, among others.